It's time for your favorite challenge - it's ANYTHING GOES at the Simon Says Stamp Wednesday Challenge Blog! The design team are playing with all things Lawn Fawn, and so our little gallery over at our blog is filled with cuteness this week! We'd love to see you using Lawn Fawn products, too, if you have them! My card this week features Lawn Fawn's Winter Sparrows and their Scripty Joy die, along with Simon's Falling Snow stencil, Ranger's Texture Paste, some red pearls and red glitter paper (and I dotted my joy with a tiny heart from Simon's Holiday Shapes). Now it's your turn! As always, we have a $50.00 gift voucher to the Simon Says Stamp Store for 1 lucky random winner of this week's challenge! And may I add to my American friends, I wish you a very happy Thanksgiving! Aren't we lucky to have a holiday that makes us stop and think about our blessings? I think we should expand it to about 3 or 4 times a year! Here's my card using this month's Simon Says Stamp Card Kit, called Winter Sparkle - so aptly named! I used the Liquid Platinum embossing powder and several motifs from the stamp set and went dotty for you! The kit includes a lovely array of cardstock, including a beautiful silver matte one from Bazzill, plus 2 embossing powders, a fun stamp set, and some gold and silver sequins. Today there's a blog hop at the Simon Says Stamp blog, featuring top designers using this kit, with a Simon Prize pack available at each stop! Don't miss it, there is some great inspiration there! Over the weekend we had another Scramble at the Hero Arts Flickr group, and our hostess Theresa chose snow as her theme - we could do anything that had snowflakes, snowmen, a snowy scene, etc. Here's the card I made. I've been wanting to try a masking technique to make a snowy scene, and this was my chance. So I tore a piece of thin cardstock and placed it about 2/3 up my panel, then sponged on some blue and purple distress inks, also masking off my moon with a die-cut circle. Then I removed my mask and moved it a little further down the page and stamped 2 trees (Hero Arts Classic Evergreen) and used some tumbled glass distress ink to make some shadows. I continued down the card with my mask, adding shadows, and finished with a fully stamped tree and my sentiment from Avery Elle's Let It Snow. Then I taped my Falling Snow stencil over the panel and added some Texture paste. And when that was dry I attached my panel to a white card base and added a couple punched snowflakes (Wplus9's Seasonal Sentiments die). I think I have lots of room for improvement with this technique, but for a first try, I'm pleased with the results - and I have another Christmas card ready! I recently came across a card that Debby Hughes made which I think is just amazing! I think that about most of her cards, but this one really touched me. I love snowflakes to begin with, but Debby has taken this one over the top, in my opinion, and I just had to make it, too. As you can see, I didn't change much, just the background color from kraft to blue, and my snowflakes are different, but the layout is Debby all the way. Thank you, Debby, for your awesome inspiration! This is one card I'm not sure I'll want to part with! The colors and inspiration photo at Color Throwdown this week are too cute not to play! supplies: navy and white cardstock, Doodlebug Designs cardstock in greens and pinks, Darice Dots embossing folder, Simon Says Stamp sentiment from Handwritten Sentiments, stamped in navy, Signo white gel pen. 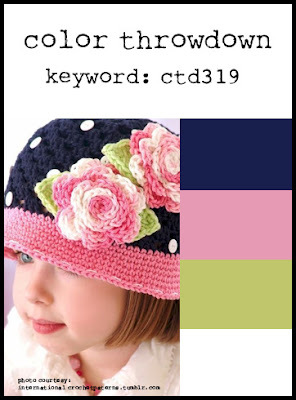 If anyone knows if that hat exists for sale, I'd love to have it for my granddaughter! This uses these Simon products: Eliza Snowflake, Christmas Blessings die, and a sentiment from their Christmas stamp set. I also added a vellum panel embossed with D'Vine Swirls and some silver and white sequins. My dies are cut from a beautiful blue and a white glitter cardstock. The winner will receive THREE brand new dies from the upcoming Die-Cember release at Simon Says Stamp, plus some Neenah Solar White cardstock and a pack of Simon's own colored cardstock! What are you waiting for?! Get creating!! Hello! It's time again for another challenge at the Simon Says Stamp Wednesday Challenge Blog! This week our theme is Thanks or Thanksgiving and the design team are using Simon's exclusive products. I stamped the wreath from a Simon/Clearly Besotted set called Autumn Blessings 3 times in 3 different inks, then fussy-cut it out and trimmed it with a twine bow and a wood veneer heart dipped in red ink, then popped it above the surface of my card. The sentiment is also from the same set, and I added some of Simon's new Fall sequins. I used another of the sentiments and some darling dangling hearts from Simon's Like Your Style set, both stamped in Simon's Lipstick Red ink. We have a $50.00 gift voucher for the random winner of our challenge. And you can spend it on anything you'd like from the fabulous Simon Says Stamp Store! 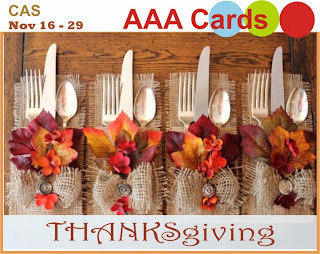 I'd like to enter my first card into AAA Cards current challenge, which is also a Thanksgiving theme. At the Less is More blog, they're asking us to use more than one tree to make a card. Here's my entry. I'd also like to enter this into the Inspiration Journal November Challenge "Happy Holidays". I just got some dies and wanted to give them a test run - what better way than to make a tag? 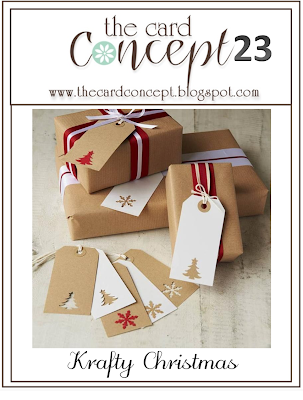 I have been inspired by Tracey's 25 Days of Christmas series on her blog, and decided to join in the fun! The tag itself is a MFT DieNamics Stitched Tag. The quilt block is a Wplus9 design from their Quilt Cuts 2 - I have wanted this FOREVER, but it has always been sold out; finally scooped a set up! I pieced it using papers from Lawn Fawn's Snow Day collection, and my sentiment is a Hero Arts one from 2009, called Holiday Sayings. This was just as much fun as making a real quilt, and LOTS faster! Also entering this into Inspiration Journal's November challenge: Happy Holidays! The sequins don't move as freely as in a regular shaker, but it's still a fun effect, don't you think? Has anyone else noticed that I seem to be fixated on birds this year? And wreaths, too, I guess. This is another entry for The Card Concept; kraft, red, and white do make a pretty color combination, and add some sparkle to it, and I'm a happy girl! There is a wonderful selection of glitter cardstock this year, and they're a much easier way to get that sparkle into a card without the mess of "real" glitter. The wreath is an older Hero Arts one called Wreath of Leaves. It was stamped in Stazon Cotton White twice to make it nice and full, then I simply added my glittery elements: Wplus9's Hand Lettered Holiday sentiment, Memory Box's Perched Reed Bird, and some punched circles for berries. I'd put it into the Clean and Layered category. Thanks for stopping by today. It's BRRRRRRR here - 23 degrees this morning! We had our first light dusting of snow earlier this week. Thank goodness the sun is shining! Enjoy your weekend! ETA: I'm also adding this to the A2ZScrapbooking November challenge, Anything Goes, and Inspiration Journal's November Challenge: Happy Holidays! I was looking through my Christmas paper pads and had forgotten about this Martha Stewart one from last year, which had these darling bird houses on one of the papers, with little touches of red glitter and lots of cardinals. So I fussy-cut some of them out, and added them to a kraft background stamped in Avery Elle's birches from Let it Snow. I tore a bank of snow and stamped it with Hero Arts Miracle of the Holidays in their Red Royal ink. Still playing with my new Winnie & Walter stamps, here's another Christmas card that will be easy to duplicate, maybe changing up the sentiment for variety. I stamped the pine in a dark and a lighter ink (VersaFine Olympia Green and Hero Arts Field Greens), just off-setting the lighter tone slightly from the darker one, to give a slightly fuller look to them. Thanks for stopping by - almost weekend! This week we're calling our challenge "Seeing Stars", and the design team are using Studio Calico products. They make all kinds of fun embellishments, plus papers and even some stencils and mists. All of the papers on my card come from their Snippets paper pad. The patterns are sized perfectly for the small stars that I used. I evidently bought the last pad, because this one is now gone from the store, but really any of their collections would work for my designs. I chose 2 neutrals for my background, and then 2 patterns each of 3 colors from the pad; corals, greens, and yellows. I cut out some stars using my Li'l Inker Stitched Stars dies using the 2 smallest stars, and cut out some star frames by using the 2 dies combined, then scattered them across my card front, using foam adhesive to pop up the smallest stars. My sentiment from Lawn Fawn's Lucky Stars set is stamped in Hero Arts Cup O'Joe ink, and to finish I added some clear rhinestones for a bit of sparkle. These stars are so cute with their stitched details that I just kept on cutting, and made another card, using the same paper pad. for the random winner of our challenge. Will it be you this week? Here's another card for Winnie & Walter's PlayDate challenge. I was inspired by the glittery gold and silver photo on the right. I stamped a Hero Arts ornament on a small panel first, embossed it in gold, and added some glitter to the snowflakes. Then I added some pine branches from Winnie & Walter's new Winter Wonderland set, stamped in VersaFine Olympia Green. And to finish I sponged bundled sage distress ink in the background. The sentiment from the same set was embossed in silver on vellum, and then the whole panel was framed in a silver glitter paper. 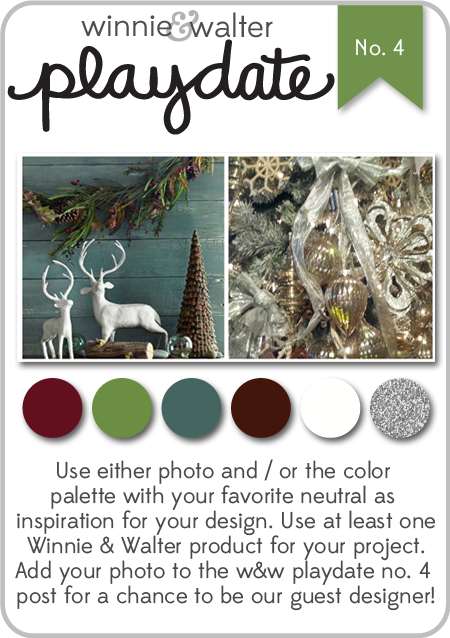 My card background uses more of the same pine sprig, and Winnie & Walter's snowflake from The Big, Bold Seasons set. I embossed them in Ranger's Silver Embossing Pearl to give a nice tone-on-tone effect. Then that panel was attached to a pearly gold frame. I'd also like to link this to Virgina' View Metallics challenge. Thanks for stopping by today - I hope to see you again tomorrow for my regular Simon Says Stamp Wednesday Challenge blog post! Here's an entry for Winnie & Walter's latest PlayDate challenge. I just received 2 of their newest releases, Winter Wonderland, and the Big, the Bold, and the Merry, so I decided to build a scene using both sets and the inspirtion and colors below. The pine sprigs, pinecones, and deer were stamped and fussy cut, then arranged as you see them, popping the branches above the rest of the card. I also added some stencilled Falling Snow, a star, and some red, white, and silver sequins that were included from Winnie & Walter in my shipment. This is the scene I had in my head, and I'm glad I was able to bring it to life! Hello! It's my turn to host the Hero Arts Flickr group's 90-minute scramble today, and I've chosen WREATHS as my theme. This is a Hero Arts wreath stamp called Pinecone Wreath. I simply stamped it, colored it with markers, and embellished it with a lacy trim, a cluster of little jingle bells, and some pearl "berries. The sentiment is also Hero Arts, from their Miracle of the Holidays, one of my favorites for Christmas! Next up, I used small elements from lots of clear stamp sets and several purple inks and made my own little floral wreath, embellishing it with purple Hero Arts gems. The sentiment is part of one from their Find Joy set, and the die-cut is part of Simon's Happy Birthday die. This uses the lovely Circle Doily, embossed in white on Carnation layering paper, and embellished with a dyed seam-binding bow and some Martha Stewart Hydrangea stickers. The sentiment is again from their Find Joy set. I made the doily into a lacy wreath by covering up its center with a die-cut circle. Thanks for stopping by today! You can see some other wreath cards HERE as they are made and uploaded to our Flickr Hero Arts group. ETA: I'm adding the first and last cards to the A2Z Scrapbooking November challenge, Anything Goes. I've started on my Christmas cards.......my friend Cat had a great idea to make 3 variations of a card each time, so that you can build up your numbers between now and December. I just received Lawn Fawn's adorable Deck the Halls set and made a wreath. I love all of Lawn Fawn's birds.....these ones came from my very first set of their's that I got, so this card uses something old and something new! It's Wednesday and time for a brand new challenge at the Simon Says Stamp Wednesday Challenge! I love the papers in this collection; they all have that aged look about them; so I let them be the stars on my cards. And you get FIVE sheets of each of 6 double-sided designs, so these pads would be wonderful if you're making a set of coordinating cards as a gift. I knew Prima first for their beautiful paper flowers, and these live up to their reputation, with a bit of glitter, and in lovely colors and prints to match the papers perfectly. Okay, now it's your turn! As usual, we are offering up a $50.00 gift voucher for the random winner of our challenge! That will be sure to come in handy with the holidays approaching! We are welcoming Vera Yates aka Ling’s Design Studio, into the Designer Spotlight this week. Vera is a super talented designer and if you haven’t visited her blog before then you are in for a real treat. Vera & Jennifer McGuire team up again for the 5th year of Caring Hearts Card Drive. The goal of this card drive is to bring joy to those that live in nursing homes through our handmade cards. Simon Says Stamp is one of the sponsors for this event and there are lots of prizes to be won so please consider sending in your cards. 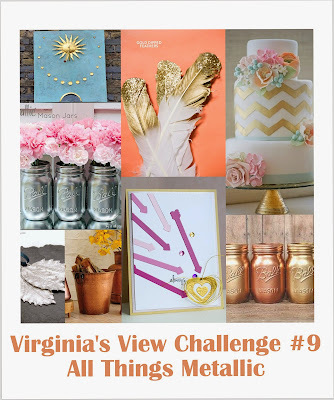 Virginia's View this month is all about metallics, and it coincides nicely with my receiving some metal sheets from Add a Little Dazzle for winning one of their challenges recently. Here's my entry - it was really a fun one to make! I used Simon's Layered Tree die and gold, turquoise, and pink metal sheets to cut the parts for my tree (the trunk is kraft), then glued it to this little pale aqua dot background. My sentiment is from Simon's Presents and Ornaments, embossed in Ranger super fine detail silver embossing powder. Since the finished panel is alot longer than it is wide, I cut my card base down to its dimensions. I'd like to enter this first one into Less Is More's Non-Traditional Colors for Christmas challenge. supplies: Aqua and white cardstock, pink and silver metal, Lawn Fawn Stitched Snowflake and Penny Black snowflake, Memory Box Peace Collage, embossed in silver as above. I strung my snowflake with some of my husband's fishing filament across the opening, and then lifted the top panel above the rest of the card base. The smaller Penny Black snowflake fits exactly into the larger Lawn Fawn one!